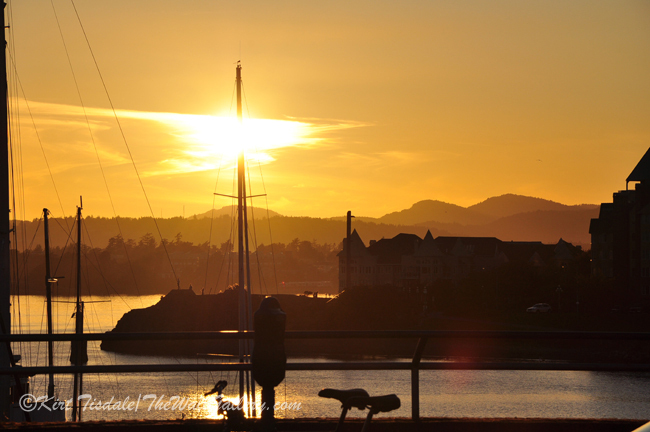 I have attached three shots I took on a trip we made to Victoria, Canada. 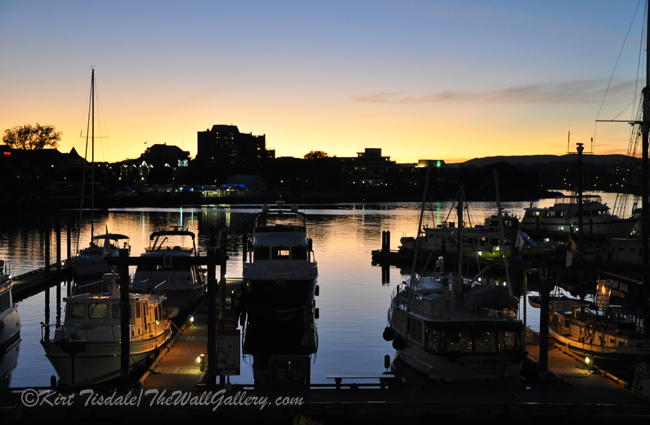 We were staying at the Fairmont Empress Hotel right on the harbor. Right in front of the hotel, we were strolling along the water taking the sights in, when I took theses shots. The first two were as the sun went down and the third one was taken at dusk. I love the colors, the boats and the water. 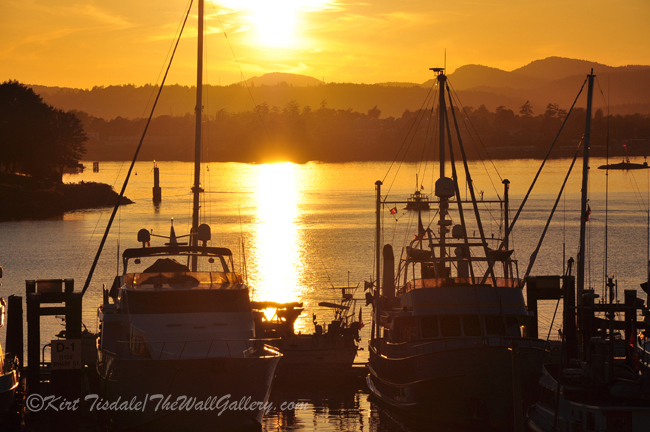 This entry was posted in Color Photography and tagged boats, british columbia, fishing boats, harbor, kirt tisdale, online art gallery, photographer, sunset, victoria, victoria harbour on February 26, 2016 by Kirt D Tisdale. After a couple of weeks of black and white photography, I thought I would put some bold color out there…..enjoy!! I have recently added this to my Abstract Bold Gallery. It was created using a fauvism (Fauvism: a style of painting with vivid expressionistic and non-naturalistic use of color that flourished in Paris around 1905) technique of a red orchid bloom. This technique uses abstract shapes and variations of colors to create a unique look. Thoughts? 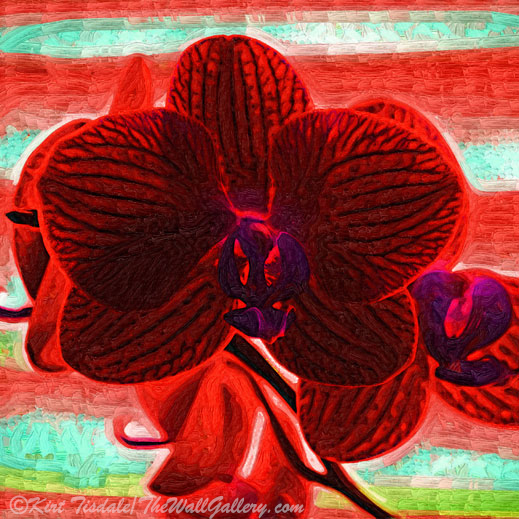 This entry was posted in Abstract Oil, Art Prints and tagged abstract art prints, artist kirt tisdale, floral, flower blossom, interior design, online art gallery, orchid, orchid bloom on February 22, 2016 by Kirt D Tisdale. 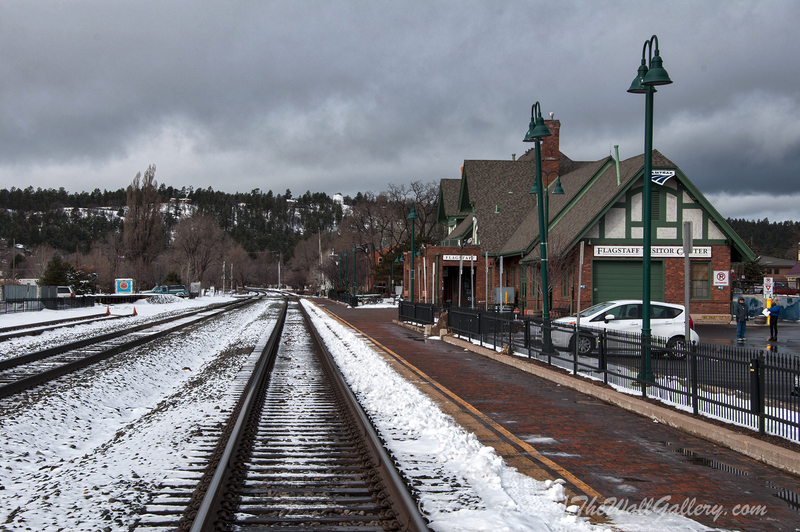 This week’s excerpts from a photo shoot take us to Flagstaff, Arizona (the railroad tracks that run through Flagstaff to be exact). 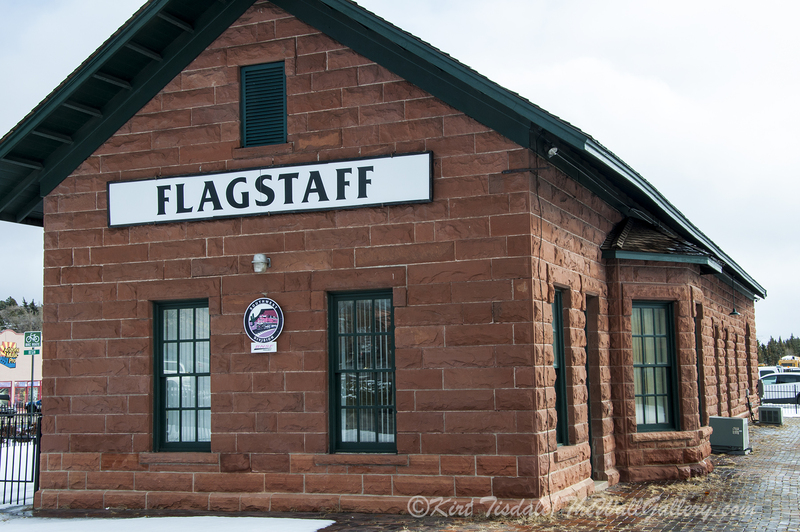 Flagstaff sits in northern Arizona up in the high country with lots of pine trees. It is very different from Phoenix which sits a few hours south. It is also situated on a very heavily traveled transportation corridor connecting Southern California with points east. 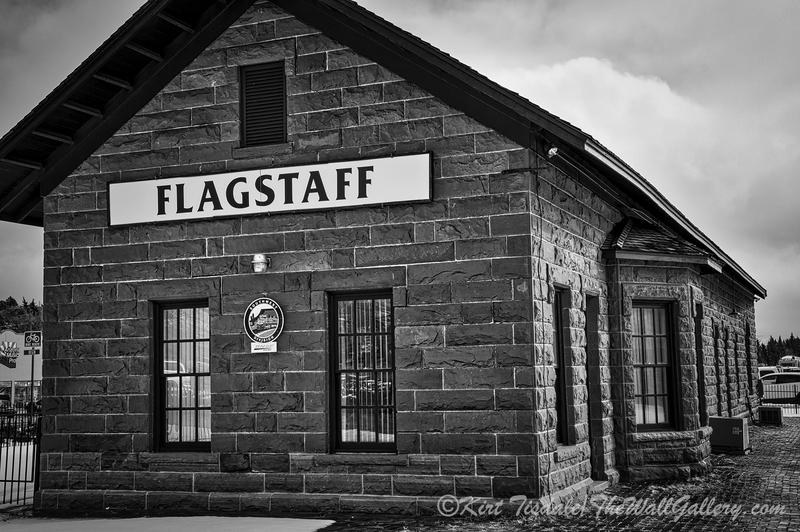 The corridor is served by Interstate 40 (following the historic Route 66 which goes through Flagstaff) and also a major rail line serving both freight and passenger train service. It seems like there is a train rolling through every half hour. We were up there the first week of January with our Seattle child and her fiancé spending time in Sedona (southwest of Flagstaff) and Flagstaff. On one of our outings, we were checking out a microbrewery which sits along the railroad tracks and after a great lunch and drinks, the gift shop beckoned the rest of our group. Shopping and me don’t really mix…I’m an in and out type of shopper, but since I always have my camera nearby, I thought this would be a great opportunity to take some shots while the rest of the group browsed. Off to the tracks I went and took the following shots between trains. Full disclosure at this point…this photo shoot was designed to be a black and white series, as that was how I was seeing the final result in my mind when I was snapping away. For those out there that aren’t as wild about B&W Photography as I am, for you I am starting and ending the series in color. The first shot is of the tracks heading west, with the current train station on the right. The second capture starts the black and white series with the same capture. I would like to point out a building in the shot that stands out better in the B&W version. Let your eye follow the sidewalk in front of the train station towards the hill in the background. If you go straight up visually to the top of the hill, you will see a small white dome structure. This is the Lowell Observatory, built in 1894 and its claim to fame is the discovery of Pluto. 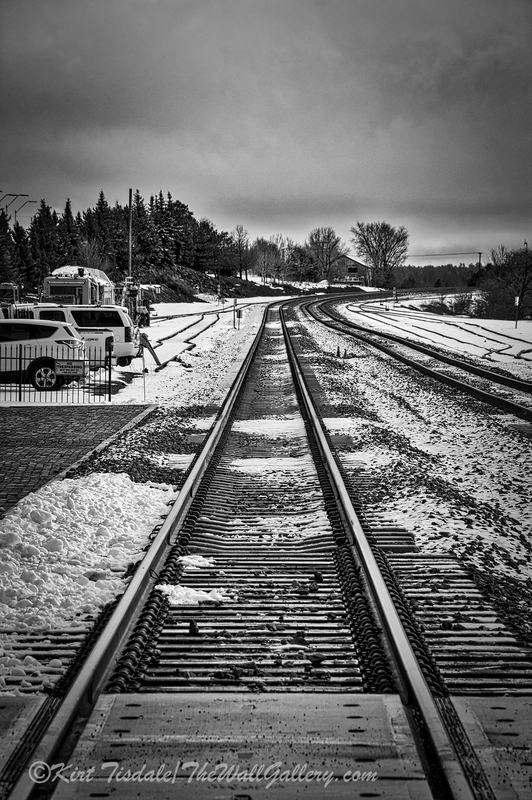 The third capture is still looking west, but with the composition of the shot centered on just the tracks. 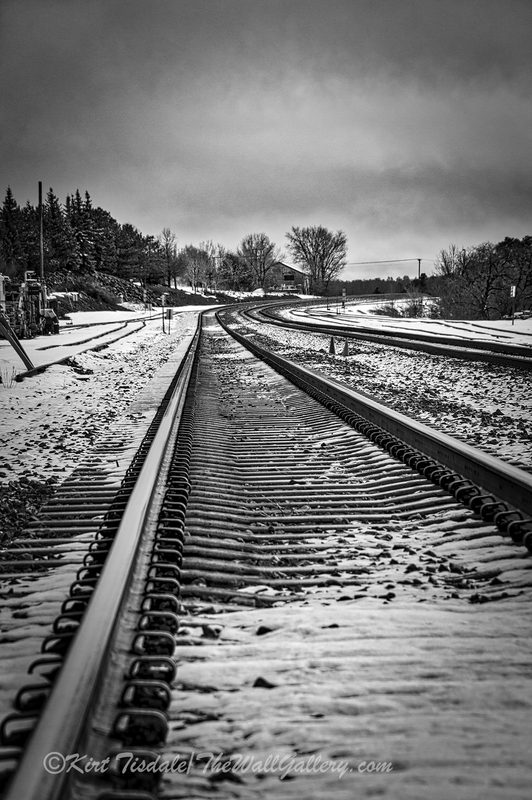 I love the depth that is created by taking these shots centered between the tracks (on these tracks, not advisable and believe me I was quick about it as I said earlier there is a lot of train traffic). The fourth shot is from me turning completely around and now I am facing east. 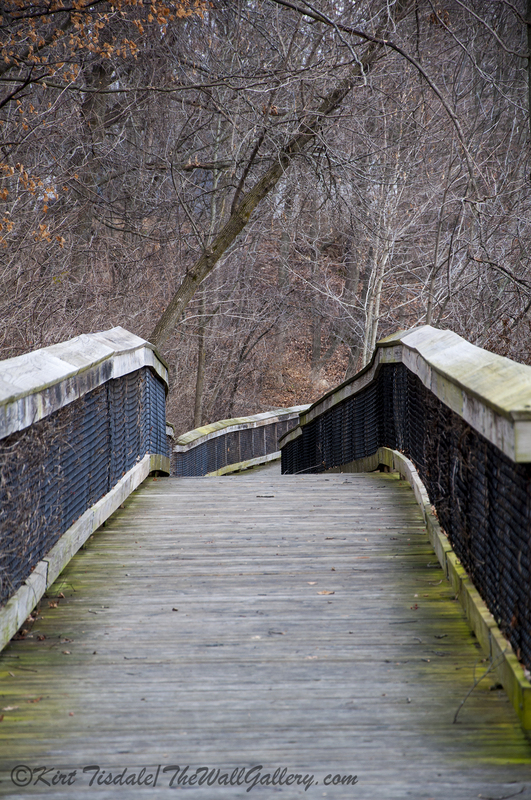 The fifth shot is in the same location with me stooping down and pulling in a tighter shot. The sixth and seventh pictures are the original train station and number six creates that vintage, historic look with B&W, but I love number seven because of the beauty of the color of the stone. 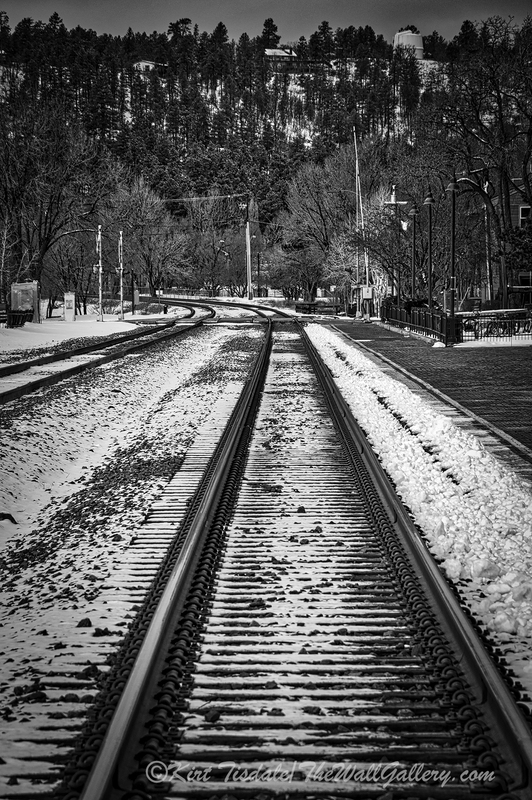 This entry was posted in Black and White Photography, Color Photography and tagged arizona, flagstaff, interior design, kirt tisdale, online art gallery, photographer, photography, railroad tracks, train tracks on February 16, 2016 by Kirt D Tisdale. 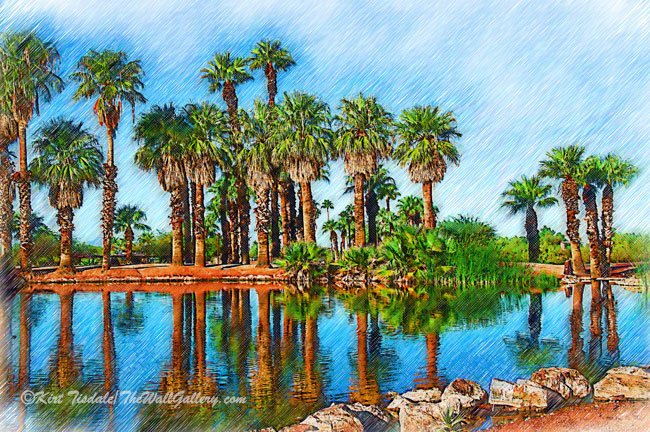 As a follow-up to a post I did early last November titled: A Pond at Papago Park, I have attached three art prints that came from that photo shoot. 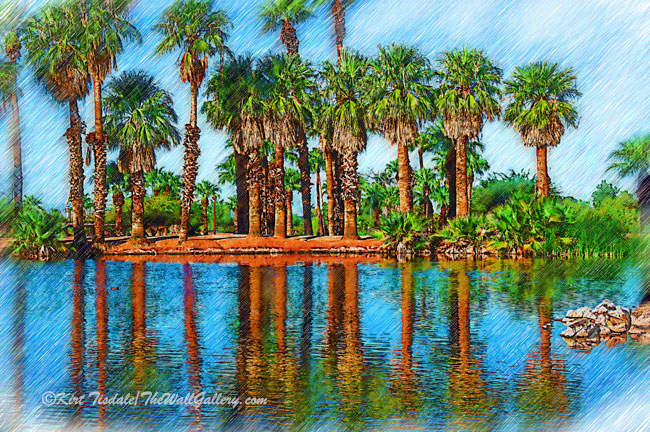 In these prints, I used a sketching and watercolor technique of the palm trees surrounding and reflected off the pond at Papago Park. I have recently added them to my Tropical Gallery. 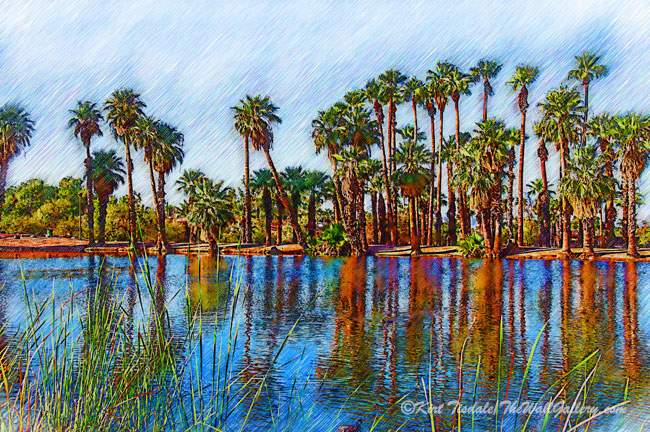 This entry was posted in Art Prints, Landscapes: Watercolor and tagged arizona, art gallery, artist kirt tisdale, interior design, online art gallery, palm trees, papago park, pond, tropical on February 11, 2016 by Kirt D Tisdale. 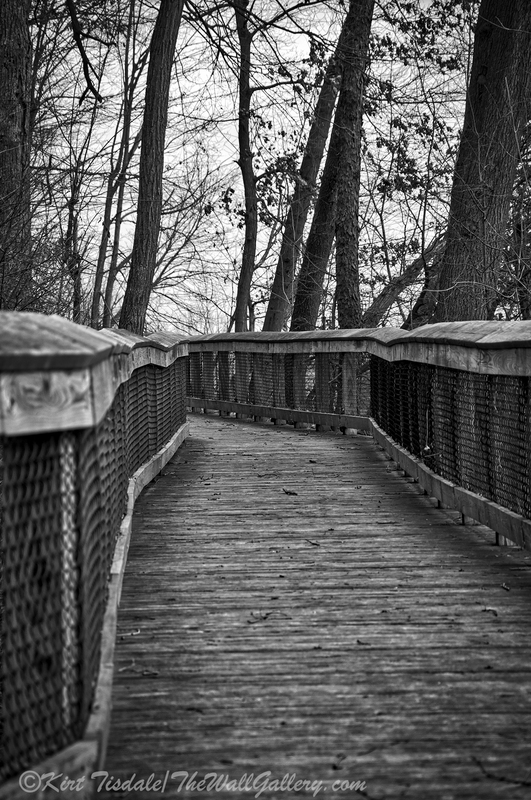 Anyone that has been following my work, knows that I have a love for black and white photography. It may be because I started shooting with black and white film in college and developed my own prints or it could be because there is a certain dramatic element that can be portrayed in black and white vs. color. The subject matter must be just right and the contrast in shapes and subjects plays an important part. I am attaching five differ captures displaying each in the original color and the final black and white print. I want to note that when I did this shoot, I saw each shot in black and white and that was my original intent. 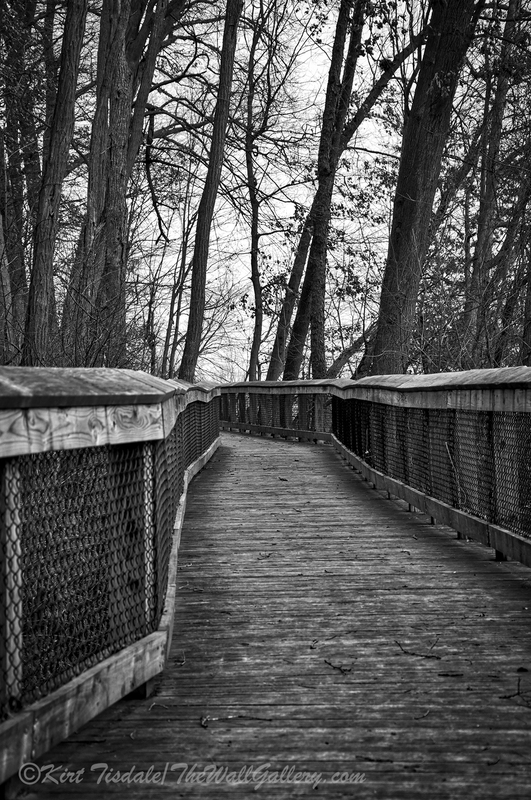 The setting is a wooden walkway along the Rogue River in Rockford, Michigan. 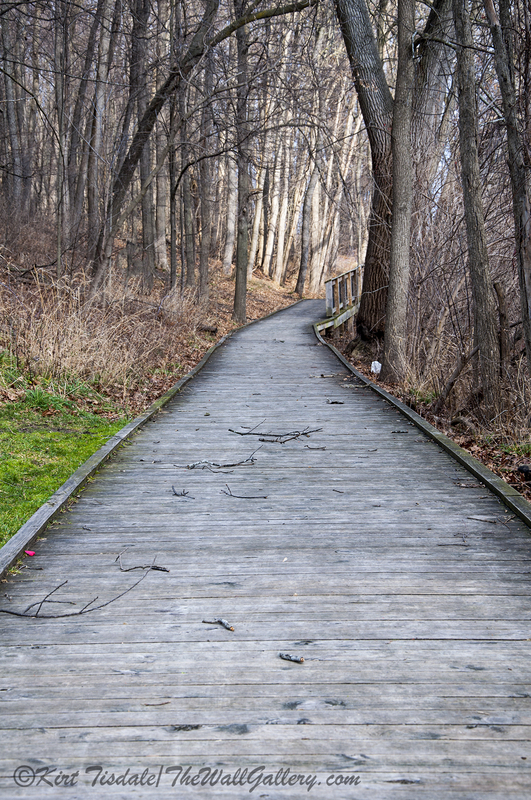 This was a typical “Kirt wandered off from the group to get some shots”, scenario. As I wasn’t into shopping in the village and knew it would take a little bit of time for everyone to agree on a restaurant for lunch, I excused myself and these shots are the result (part of the result…more to come from another area of the river). 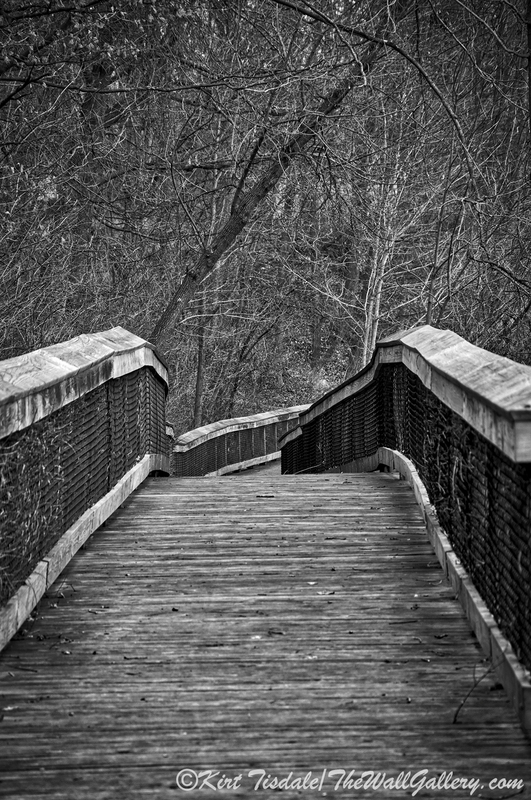 I also want to note if I had been at this location during peak fall colors, we wouldn’t be having this discussion on black and white photography with these shots. 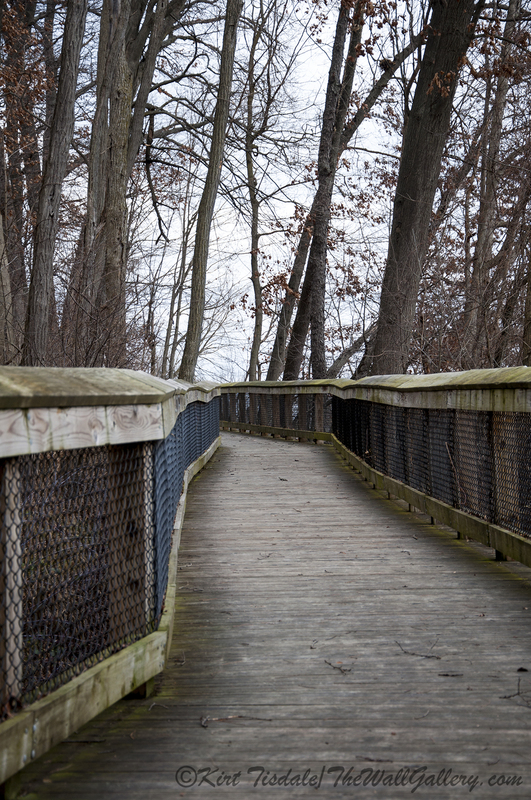 What I like about these pictures, is the depth the walkway creates as it winds along the river between the trees. 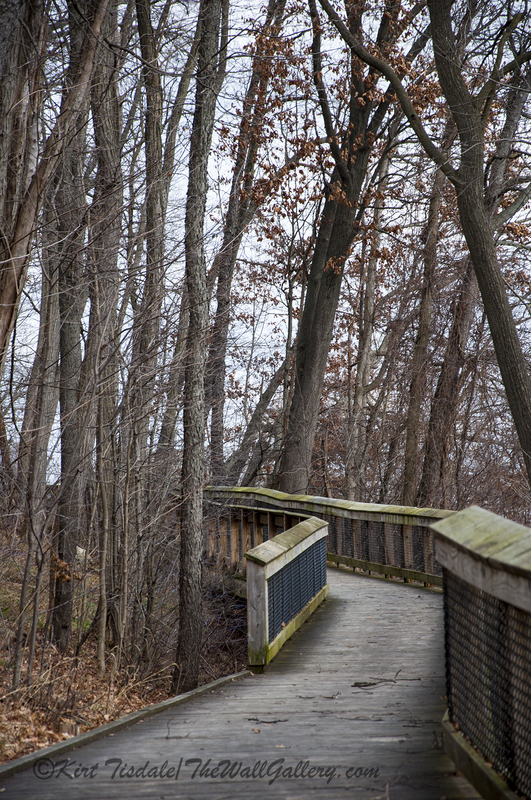 Since it is winter, the branches create a separate element of contrast. 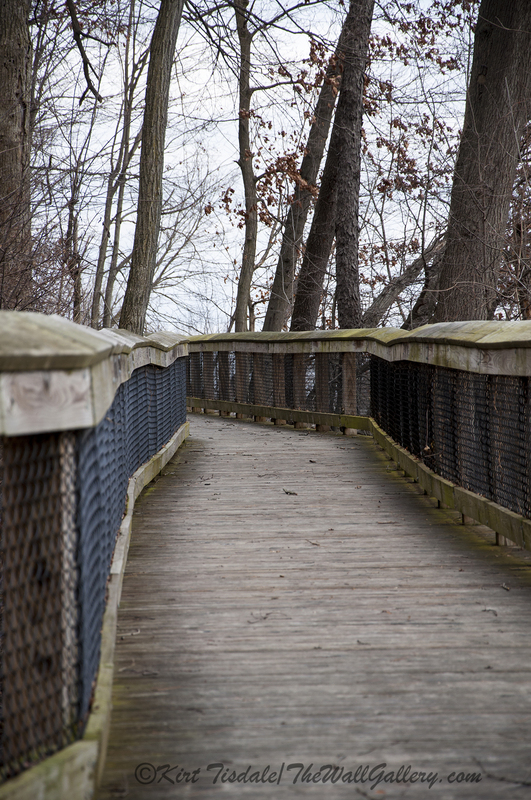 I shoot in RAW format, so I can adjust the detail and contrast to give an edgier look, which I did. I am going to frame three of them in my office, so would appreciate any feedback on which three. 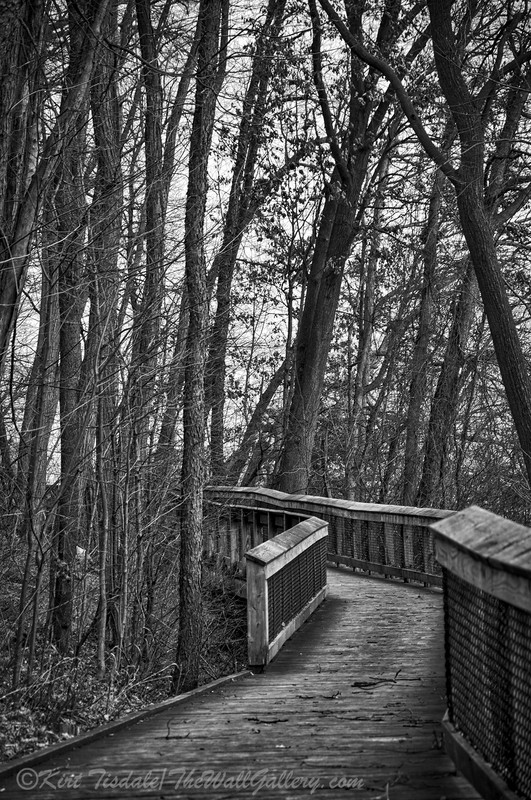 This entry was posted in Black and White Photography, Photography and tagged hiking, kirt tisdale, michigan, online art gallery, path, photographer, photography, river walkway, rockford, rogue river, winter trees on February 5, 2016 by Kirt D Tisdale. In Arizona, we have some very vibrant sunrises and sunsets. With high level clouds scooting across the desert sky, the sun reflects a brilliant light show as it rises or sets. As this occurs, you have moments where the entire landscape takes on varied hues of brilliant color. This particular art print represents one of those moments at sunrise. For this piece, I intensified the yellow I was seeing reflected off the lake. Keeping the palm trees a dark purple gives a bold contrast to the sky and the reflective waters. It turned out as kind of a bright and fun, surreal depiction using a fauvism technique with the brush strokes. Thoughts? 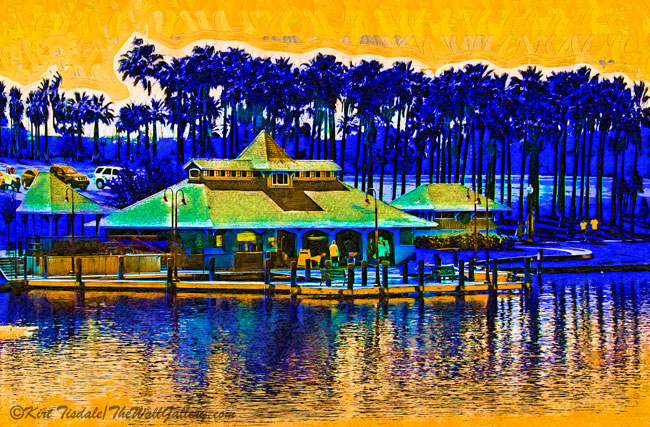 This entry was posted in Abstract Oil, Art Prints, Landscapes: Oil and tagged abstract art prints, arizona, artist kirt tisdale, interior design, lake, palm trees, photographer, sunrise on February 1, 2016 by Kirt D Tisdale.